As was evident during her relationship with Twilight co-star Robert Pattinson, Kristen Stewart was once fiercely private of her personal life and often spoke about that fact. But recently, Stewart told the Los Angeles Times that she was no longer hiding her relationships, in a refreshing change for the star. Proving this fact further, in the September issue of Elle UK, Stewart spoke about her girlfriend, Alicia Cargile, and shared an inspiring message about the road to embracing her sexuality in the public eye and the implications that come along with it. After a year of speculation from tabloids and dodging any mention of her relationship, Stewart opened up about Cargile in a very beautiful way. She told Elle of her current relationship, "I think also right now I'm just really in love with my girlfriend. We've broken up a couple of times and gotten back together, and this time I was like, 'Finally, I can feel again.'" 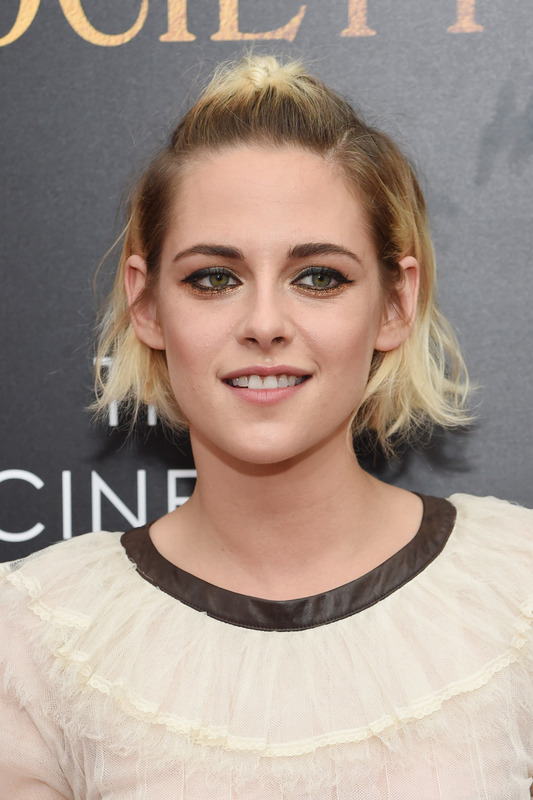 While Elle notes that Stewart is talking about Cargile, the actor doesn't have to mention her by name to know who she means — they haven't exactly been hiding in recent photos. It sounds like their love is the real deal and it is lovely to see Stewart comfortable enough to speak out about it. "When I was dating a guy I was hiding everything that I did because everything personal felt like it was immediately trivialized, so I didn't like it. We were turned into these characters and placed into this ridiculous comic book, and I was like, 'That's mine. You're making my relationship something that it's not.'" "It changed when I started dating a girl. I was like, 'Actually, to hide this provides the implication that I'm not down with it or I'm ashamed of it, so I had to alter how I approached being in public. It opened my life up and I'm so much happier.'" I find this outlook to be very telling about her current state of mind and relationship. Stewart is so committed to the new love in her life, that she was willing to shed any previous hang-ups and, along the way, became even more honest about herself than before. This is an inspiring message for any of her fans. In being true to herself and who she loves, Stewart is an example that living your truth is a path to acceptance, and it's a beautiful thing that she learned this through her relationship. She is proud of following her heart. "I’ve discovered a way to live my life and not feel like I'm hiding at all... Somehow, as I got older, I reoriented my mind. I’ve gotten better at assessing people's motivations... It’s not something I have to overtly think about — what I share and what I don’t share. It’s a natural thing. Whereas, when I was younger, I was like, 'You're gonna screw me over.' Now I’m like, 'Whatever. You can't.'" Rather than cowering in the face of rumors, pressure, and speculation, Stewart has grown up and taken matters into her own hands. She is in love and putting herself out there, and there is nothing that can stop her now.